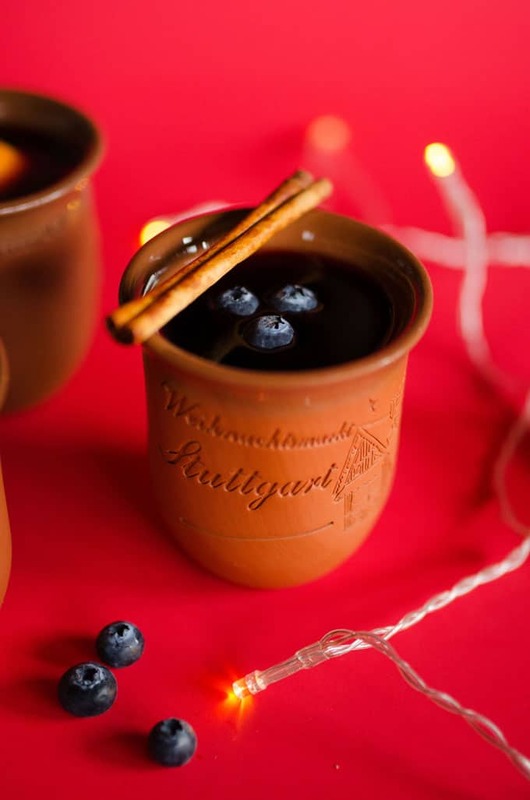 Experience the cozy German Christmas markets without ever leaving the comfort of your home with this Blueberry Gluhwein recipe! 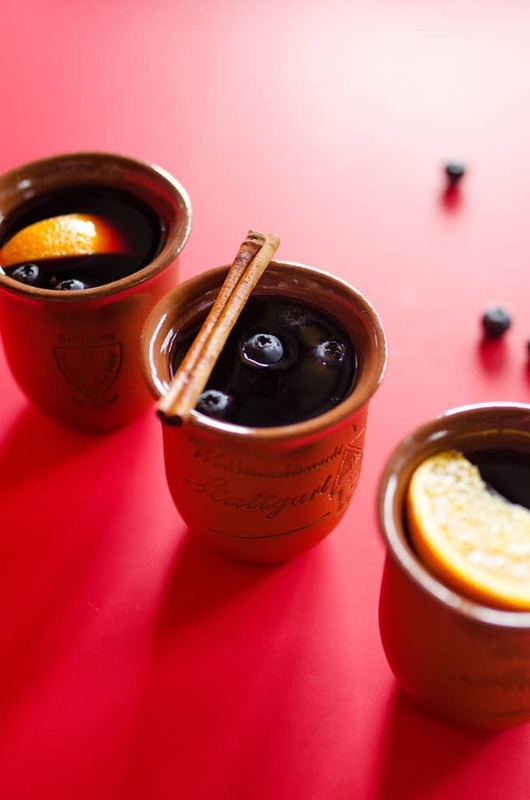 With only 5 ingredients, this is a simple mulled red wine to warm your bones this winter. It’s finally winter here in Europe and that can only mean one thing…Christmas. Christmas time in this neck of the woods is one of the most magical times. 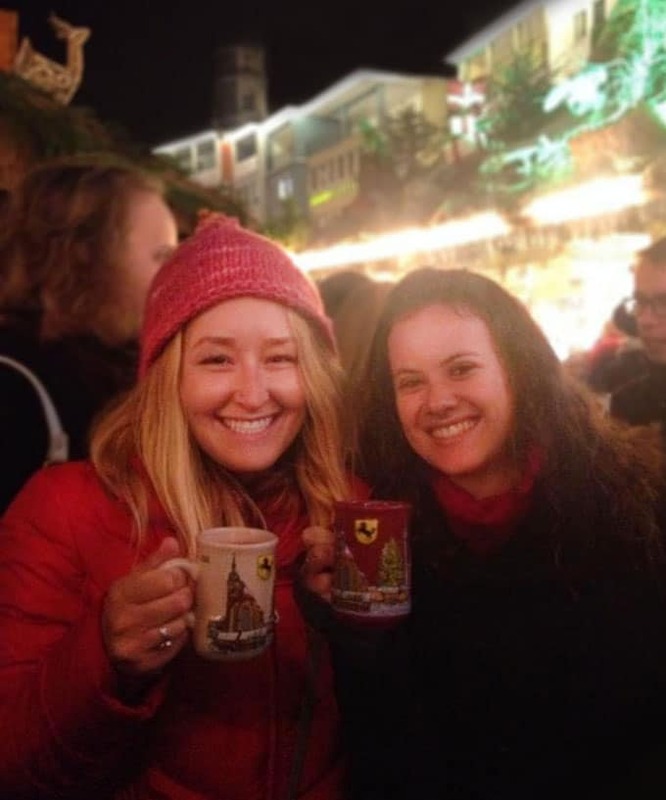 Bustling holiday markets and the cozy smell of roasted chestnuts and best of all, gluhwein! Gluhwein is the German version of mulled red wine and it accounts for roughly 96% of the magic at the German Christmas markets. So today we’re bringing that magic right onto our stovetops with an ultra-simple take on this drink, complete with blueberries. Blueberries tend to be forgotten in the winter months, but I think it’s about time we change that. 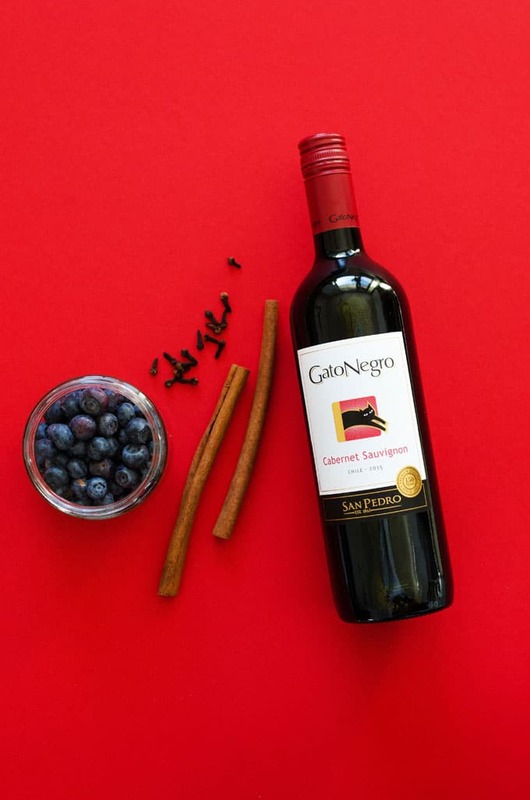 These versatile little guys go well with loads of holiday recipes, especially with this gluhwein. I like to keep a bag of them in my freezer for when inspiration strikes! Okay so here’s what you need: cinnamon, cloves, blueberries (fresh or frozen), sugar, cheap red wine. The whole point of gluhwein in the olden days was to salvage scrap/bad wine, which is fortunate for folks like me who know very little about wine, and therefore make their wine selection almost solely based on the fact that there was a cat on the label. You’ll essentially just blend up the berries, let everything seep together, then strain and serve. 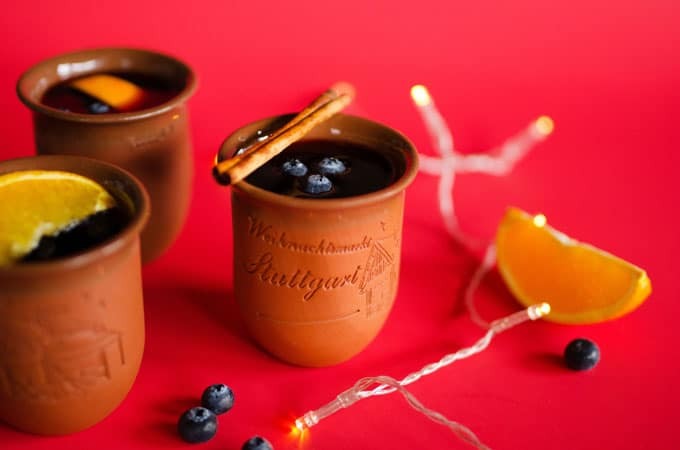 You can pick up the ingredients on your way home and have homemade gluhwein within half an hour. Now that, my friends, is magic. In a saucepan over medium heat, combine blueberries and sugar. Cook until lightly simmering, about 5 minutes. Puree blueberry mixture until smooth, then add in cloves and cinnamon. Continue lightly simmering for 20 minutes. Pour wine into the pot and reduce heat to a very slow simmer (don’t boil), at least until wine is warm (you can let it sit on low heat anywhere from 15 minutes to 3 hours). Strain before serving. Serve warm optionally garnished with a slice of orange and a cinnamon stick. Thanks to the U.S. Highbush Blueberry Council for sponsoring this post! Thoughts and opinions, as always, are my own. Check out more simple blueberry cocktails (like the Blueberry Bellini below) at their website. This post contains affiliate links, which means if you buy something from that link I may earn a commission, at no extra cost to you. 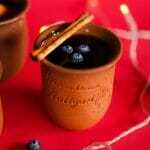 Thanks for supporting Live Eat Learn and for making this gluhwein recipe possible! Can this be made up a day or two ahead and re-heated? Thanks!